“After the perils of Iceland, the Bakers plan to enjoy a relaxing vacation with their relatives, the Drakes, in Scotland. 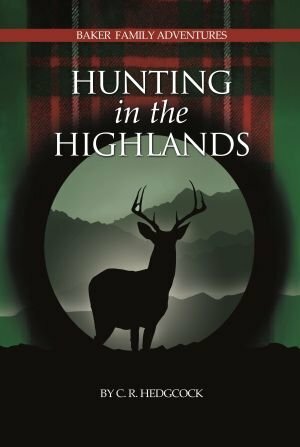 Andy goes deer stalking with Uncle Clive, Abby goes horse-back riding and sightseeing with Phil and their cousin Millie, and Tom travels with his parents to the Isle of Bute. Recommended age range: I know an ten-year-old who is reading it to an eight-year-old, and they are both enjoying it, but some of the content might be a little confusing to younger children… I admit that I didn’t fully understand everything the main characters were talking about… but more about that in the review. 😉 I’d say 12+ would be a good age to read it. Wow. I’m pretty sure that this is my favorite book in the Baker Family Adventure series, and I’ve read them all (but I’ve only reviewed The Treacherous Trail and Peril on Providence Island on this blog). It was so complex; I’m sure I could never write a book as intricate as the Baker Family Adventures- kudos to Miss Hedgcock! One thing I like about this series is that you don’t always know what is going on. I’m a mystery lover, and I’ve read a lot of mystery books. A lot of times, it’s pretty easy to figure out who did it, or whatever, but in this series, you don’t figure it out until the author reveals it. ❤ I love it! When Abby is escaping with the Freylads… it’s amazing how good they are with tracking! The submarine- it’s so amazing how they stole it. Just… wow. When Millie, Alistair, and Abby are trying to find the tape on the tower thing… it’s so cool they were all dressed perfectly for the reenactment!